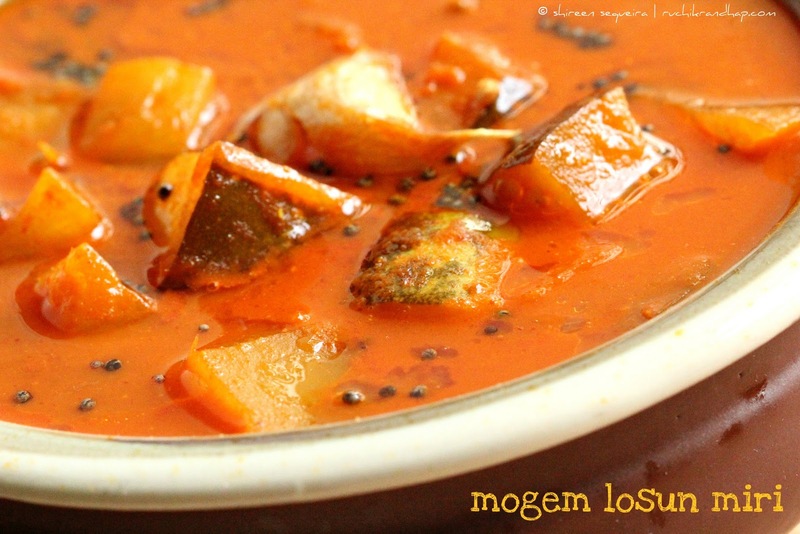 One of the most traditional Mangalorean vegetarian curries would have to be the Mogem Losun Miri – a delicious all season curry made with Field Marrow (found in supermarkets today under the label ‘Madras Cucumber’) in a mildly spicy and fragrant curry made predominantly of garlic, pepper, chillies and onions ground to a fine paste along with other ingredients. In the olden days when people used to eat a lot of home grown vegetables, the Mogem (nasal pronounciation of ‘Mogay‘) along with other vegetables that were harvested from one’s own field and those that had a longer shelf life used to be stored for many weeks by hanging them from the ceiling, firmly bound by dhoriyo (thin coconut fibre ropes). Every household had many mouths to feed and hence one could find a host of such veggies ranging from Field Marrows (Mogem), Pumpkins (Dhudheim), Ash Gourds/Pumpkins (Kualo) & Bottle Gourds (Bobleim) waiting patiently to be cooked one by one in a khodi (spiced coconut curry with a combination of vegetables & legumes/dried sea food/meat) or fugath (dry side dish made with the tempering method) or thel piao (semi dry side dish made with the stir fry method) or sweet dishes like kheers (payasams) or halwas. This ‘hanging garden’ used to be found in a long corridor beside the kitchen in almost every house with a tiled roof. By the way, the architecture of all these houses were almost the same. Three or four steps led to the entrance of every house which then branched into a sopo (porch) that was built in a symmetrical fashion. One side of this long and thin porch overlooked the garden – one could sit on the graadhi (parapets) & enjoy the evening breeze – I have spent many childhood moments enjoying the breeze or watching the pitter patter of raindrops during the monsoon from these parapets. The porch was also a place where the less important activities were held and the special happenings took place in the inner hall or living room which again branched out into bedrooms and the kitchen (which was almost always on the left side of the hall). This kitchen – the place which housed the hearth fuelled by lankhod (firewood), pidey (dried palm stems), sonna (dried coconut husks) & khatti (coconut shells) was the place where the most delicious meals were prepared. However, such kitchens were not the prettiest thanks to all the kheri (coal dust) that formed a layer on the walls & ceilings – but then no one complained as every kitchen met the same fate and modular kitchens weren’t in vogue then anyways! I think the aromas (of the earthen pots, the firewood & the spices) that wafted through the kitchens were sealed in the dish that was being cooked and made the food more enjoyable & sustaining. I can’t imagine a modular kitchen giving the same result today – which is why I largely believe that traditional methods and modes of cooking play a predominant role in the superior quality of a dish. This along with the right combination of foods made for a complete meal. 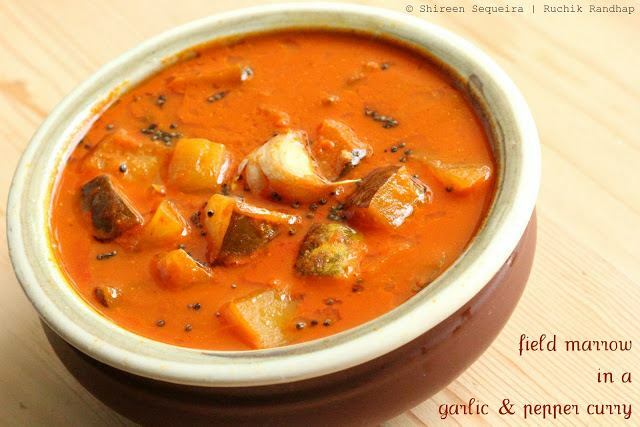 When I say ‘combination of foods’ it means that a vegetable curry for example when eaten with unpolished rice, a side dish of meat, fish (often dried fish), pickles & curds was nothing but a simple yet healthy combination of carbohydrates, proteins, vitamins and nutrients. Hence a combination of the right cooking techniques, organic ingredients and a balance meal played its part in ensuring healthy minds and bodies – little wonder then that our ancestors were far more healthy & with fewer ailments than the modern generation. 1. Wash the the field marrow and cut it into half and then quarters, remove the pith & seeds and then cut into small cubes. Keep aside. 3. In a wok or pan add the masala, 1-1/2 cups of water, cubed field marrow, sliced onion, jaggery and salt to taste. Mix and bring the gravy to a boil. Reduce the flame to a medium low and cook till the field marrow is tender but firm. 4. For the seasoning – heat oil in a small pan and toss in the mustard, when it stops spluttering add the crushed garlic and pour this seasoning into the curry. Cover the pan immediately to retain the fragrance of the seasoning. Turn off the flame. 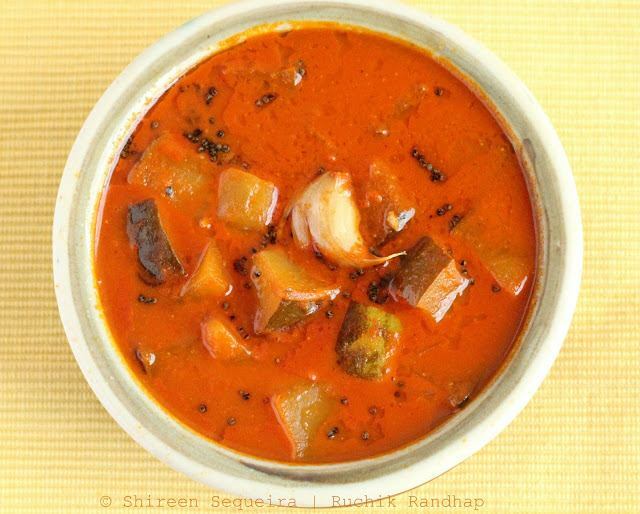 Omg, wat a super delicious curry, would love to have with a bowl of rice.. Delicious and mouthwatering curry. Wonderfully prepared. Shireen,Thanks for this recipe. I have always wanted to make these cute looking cucumbers, but did not know how. This one looks incredibly delicious! bookmarked ! very delicious curry, looks great Shireen..
Nice recipe & the colour is super awesome……just makes me feel hungry. tried this recipe today..awesome..along with mogem my mother use to put few jack fruit seeds..soon going to try other recipes too.During Christmas time i tried your plum cake it was excellent. i tried this recipe today it is very very good..along with mogem my mother use to put few jack fruit seeds.going to try other recipes soon. Thank you Anonymous & Lewis for your lovely feedback!! It feels good to know that you tried & liked the recipes 🙂 Yes, you can add bikna-jackfruit seeds to most Mangalorean veg curries..tastes awesome! Shireen, thanks! I have been struggling to get this curry right! Believe me, when one is away from Mlore, and finds a mogem in the sabzi shop, one just picks it up! And then…one has to cook it right….after many failed attempts, thanks for giving me my first hit! Thank u so much for your feedback Sharon!! Feels great to hear that the curry was a hit!! Glad u enjoyed it! @ Anonymous: Yes, the first time it is to fry the onions. And later it is to used to fry the seasoning – hence I have mentioned it under different heads 🙂 Hope u like it! In the list of seasoning Mustard has been missed out. @ Karina: I am not sure what could have gone wrong…if you have used an old mogge (not tender) the flavour may have changed. Also, if you have used too much tamarind it could have caused the taste to turn sour. Please do give this recipe a try again and I hope it works for you! Hi Shireen. Your recipes are simple and great. Moreover I'm not from Mangalore. So my way of cooking is quite different from Mangalorean food. So this blog has really helped me a lot to prepare some of the dishes Mangalorean style which my family likes. Thanks a lot. @ Olivia: So nice to hear that! I am glad that my blog is helpful and your family likes it 🙂 Do stay tuned for more recipes! Absolutely wonderful. Statisfy the need for spicy and sweet together.